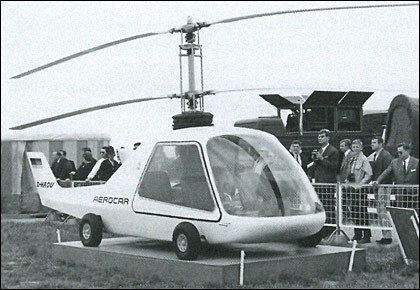 The Rotocar III has developed into the Aerocar, whose prototype flew in 1965. This has a 4-seat cabin, a twin tail assembly, and four road wheels hydraulically driven from the Oredon IV engine mounted behind the rotor pylon. 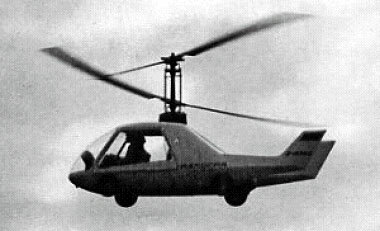 Wagner also built a prototype (D-HAGU) of the Aerocar roadable helicopter, powered by a 260hp Franklin 6AS-335-B engine, which had a complete body shell with twin fins and four wheels linked to an automobile drive system for its ground transport role. It was first flown in 1965. It was subsequently rebuilt with a Turbomeca Oredon turbine engine. The Wagner Aerocar was a German four-seater roadable helicopter based upon the Wagner Sky-Trac helicopter and first flown in 1965. The Wagner Aerocar differed from the Wagner Sky-Trac in having a enclosed cabin and road wheels. Cool! Just posted a YouTube of my "Helicopter Model 4 Monocopter" that uses the principal used on the Wagner Rotocar. Just learned about this! It's very helpful/interesting. I would like to know more about what have become of those coaxial helicopters .